Tethered cord – failure in regression of caudal cell mass: The failure of regression of caudal cell mass gives rise to hypertrophic or fibrous filum terminale. Decreased viscoelasticity of a thickened or fatty filum places traction on the lower spinal cord, displacing the conus below the level of L2. Occult tethered cord can present with clinical features of tethered cord syndrome (TCS) without radiographic evidence of a low-lying conus (1). Lipomyelomeningocele – error during secondary neurulation: Errors in secondary neurulation, or abnormal/ incomplete regression of caudal cell mass results in the development of lipomyelomeningoceles. Lipomatous tissue incorporates into the conus medullaris or filum terminale. Lipomatous tissue, not neural elements, herniates through the dorsal spinal defect and attaches to subcutaneous mass. Fatty tissue can cause local mass effect on neural elements or traction on the conus, with or without evidence of a low-lying conus (9). Split cord malformation – possible remnant of neuroenteric canal: Development is poorly understood. It may be due to a persistent neuroenteric canal between the yolk sac and amniotic cavity. The anomaly consists of two hemicords with its own central canal. It is called a diastematomyelia, or SCM type I, when the hemicords are separated by two separate dural sheaths, and diplomyelia, or SCM type II, when the hemicords are housed in a single dural sheath (9). 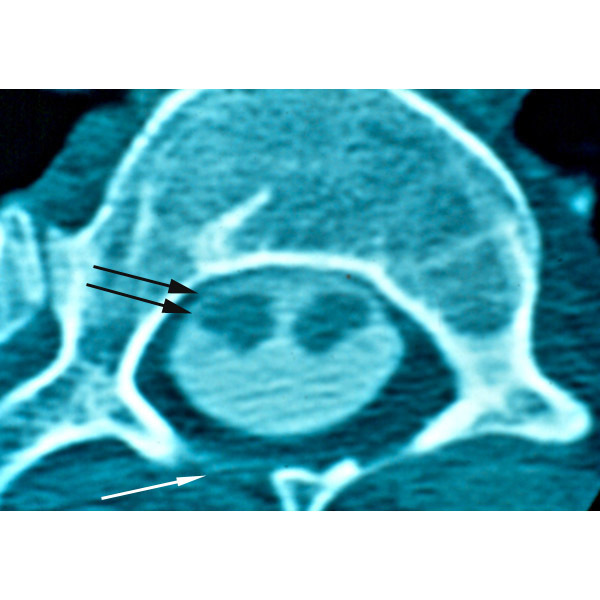 CT myelogram of lumbar spine: The double arrows point to a split cord malformation (diastematomyelia). Also seen is an incomplete closure of the spine’s lamina (spin bifida) that single arrow points to. Traction injury to cord: The stretch applied to the cord during movement due to the tethering has been shown to cause ischemic injury.